SB 251 (Collector Steven Brack) Ixmiquilpan, Hidalgo, Mexico. Origin and Habitat: Coryphantha clava (= Coryphantha octacantha) is endemic to Mexico. It has been reported to be present in the states of Aguascalientes, Guanajauto, Hidalgo, and Querétaro, also it rarely occurs in the states of San Luis Potosí and in Tamaulipas. This is a widespread species found at innumerable localities, with a very large population, and with many plants occurring in huge groups in remote areas. Habitat and Ecology: The species grows in dry grassland on limestone gravel or alluvial soils at the foot of hills and on ridges. Accompanying species can be Echeveria secunda, Dasylirion acrotichum, Echinocereus cinerascens, Ferocactus latispinus, Myrtillocactus geometrizans, Stenocereus dumortieri, Opuntia imbricata, Coryphantha radians, Gymnocactus horripilus, Mammillaria geminispina, Echinocactus platyacanthus, and Neolloydia conoidea. Although there is some illegal collection, this does not appear to be a major threat. The main threat to the species is increasing frequency of fires to renew grazing areas for livestock. 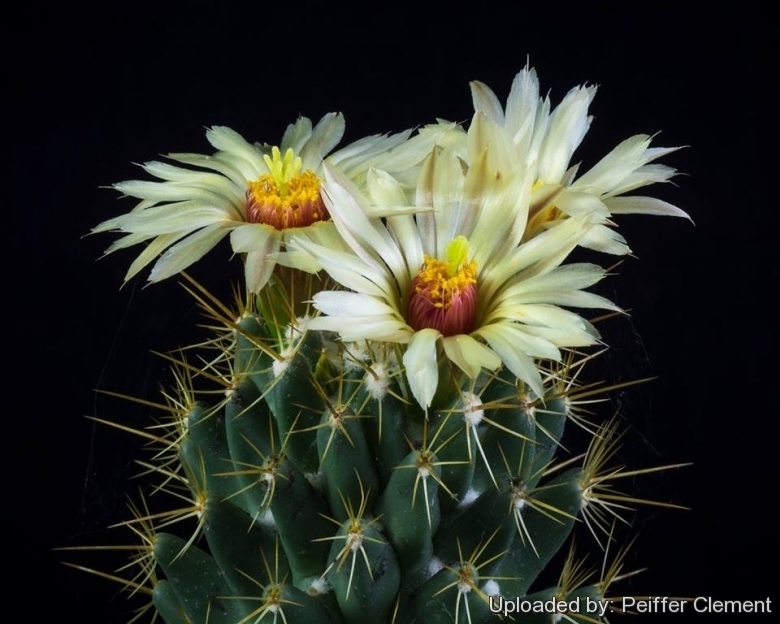 Description: Coryphantha clava continues to exist in the whole cactus literature until today, although its description does not show any differences to the ones of the complex around Coryphantha octacantha, and should be fully synonymized with the latter. 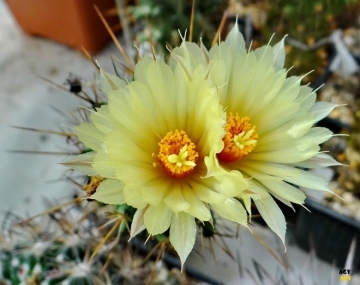 Coryphantha clava, with a club-shaped, deep green body and white and yellow spines, grows prolifically. Plants are solitary or branch basally to form clumps. The axils of the tubercles are filled with white wool, with a vivid scarlet gland at the base of the groove. The pale-yellow blossoms are very large and showy, the outer segments tinged with scarlet. This striking species is widely cultivated as an ornamental. Given the wide range of this species and its appearance, it was collected and sent to Europe very early. Derivation of specific name: “clava', club; for the shape of the stem segments. Stem: Cylindrical to club-shaped, deep green, up to 30 cm tall, initially erect but becoming prostrate with age. Tubercles: Erect, elongated, somewhat 4-sided Axils of tubercles with white wool and with a red gland at base of groove. The glands tend to exude a sugary solution when growing. Areoles: Coryphantha clava has a common type of spine-areole, white-villous with a strong central spine that is somewhat curved and numerous thin radial spines that tend to lie flat against the stem. Radial spines: Usually 7, straight, horn-colored, about equal. Central spine: A little longer and stouter than the others. and mucronate at apex; filaments orange; stigma-lobes 6, linear, yellow. 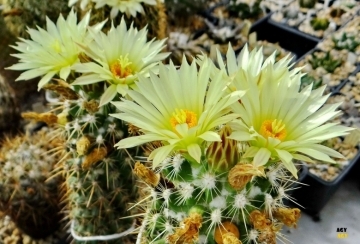 Cultivation and Propagation: Coryphantha clava is popular with collectors and easy to grow. It comes from an area of summer rainfall. Keep drier in winter (but for outdoor cultivation it is quite resistant to wet conditions, too). Quite cold resistant, hardy about to about -10° C, but the frost resistance varies a lot from clone to clone. Needs good drainage. Keep drier in winter, Full sun to partial shade.